After surviving my first overnight train, I arrived in Budapest just after sunrise. Too stubborn and cranky to wait for a bus, I dragged my massive suitcase two miles across town. I went straight to my hostel and attempted an early check in – unfortunately I failed miserably. Instead, I curled into the fetal position and proceeded to nap on a random couch in the hostel lobby until check in time. Miraculously, this was still comfier than the pathetic excuse for a bed in the train. Harry Potter made it look so glamorous. I eventually checked in a few hours later, took a hot shower, and finally began my day. I discovered a nearby cafe (shockingly with working wifi, a rarity in Budapest), ordered a double shot of espresso, and caught up on some work before heading back to my hostel for a much needed beer. It was Saturday night and all I wanted to do was sleep, but I hung out in the hostel lounge and began drinking instead. Within minutes, I met two Kiwi’s from New Zealand and a group of Aussies. We played a few games of pool and had a few more beers, before proceeding to bar hop Budapest’s infamous Ruin Pubs for the rest of the evening. Ruin Pubs are composed of rejected furniture and unique knickknacks to create an unusually awesome, hoarders dream. I enjoyed my beer nestled between a rusted bathtub and various bike parts. Somewhere between Szimpla and Instant, we were separated from the Kiwi’s and I realized we only added each other on the photo sharing application, Snapchat. 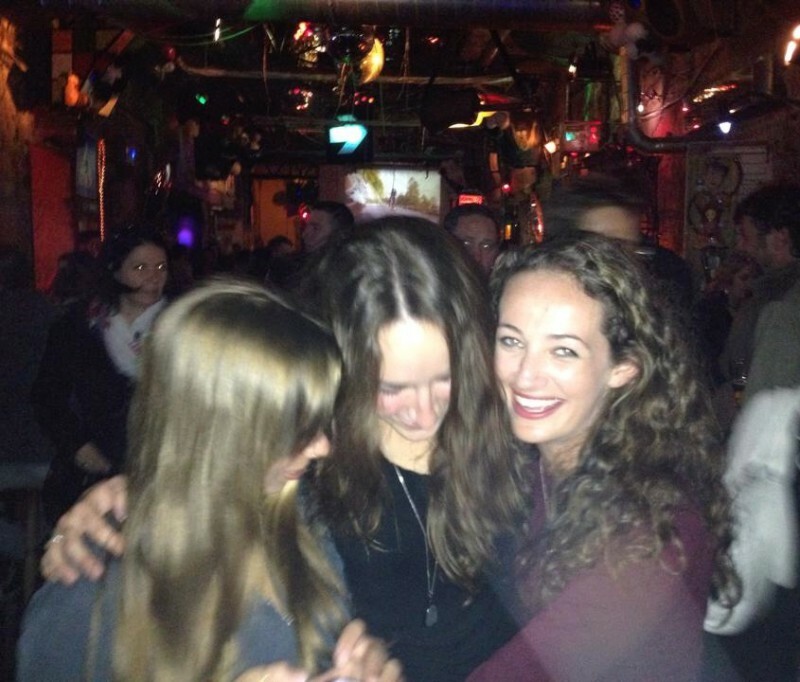 We stepped inside a few underground bars and random establishments trying to find the rest of the group. But to be honest, it was pretty entertaining just supervising my Aussie companion drunkenly trying to locate his friends. Our search was compromised by our appetite for late night food, so we stopped for Kebabs before heading back to the hostel. I sent a snapchat of my kebab in a final, desperate attempt to locate the rest of the group… kebabchat was not received. Defeated and exhausted, we called it a night and passed out. The following morning, I woke up to new Swedish roommates, who had stumbled in at around 6am. A bit hungover, we all went out to breakfast. On our way out, the Kiwi’s responded back to my kebabchat, we managed to properly exchange phone numbers, and we all met up at breakfast. 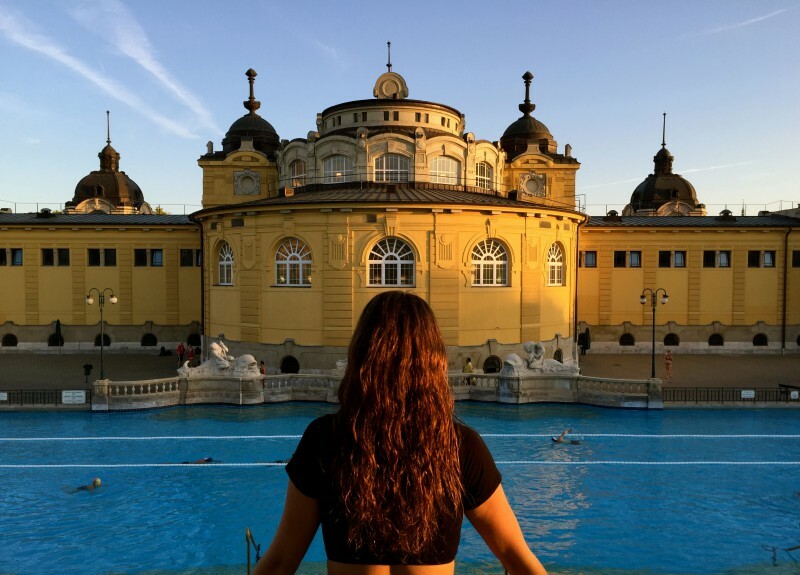 We pieced together the previous evening over some omelets and headed to Széchenyi fürdő, the largest thermal bath in Budapest. We proceeded to enjoy a very lazy spa day and recuperate in true Hungarian style. The next couple of days seemed to completely fly by. I found a donation-based walking tour that guided us through the streets of Pest to the hills of Buda. Buda and Pest used to be two distinctively different cities until they were united in 1873; Locals still refer to one side of the river as Buda and the other side as Pest. 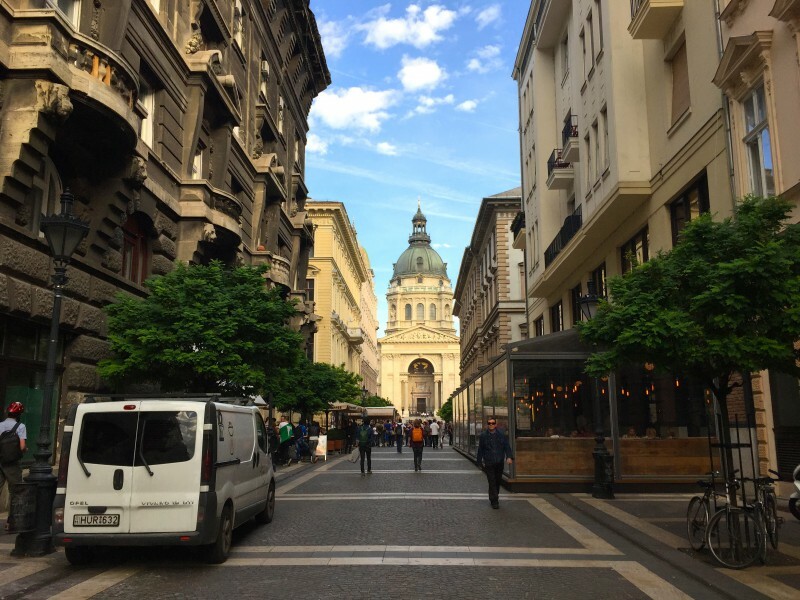 We started at St. Steven’s Basilica, we made our way across the Chain Bridge, and up Castle Hill to Matthias Church and Fisherman’s Bastion for a panoramic view of the Danube River and all of Budapest. Everything I wanted to do and see was within such a short walking distance, so blindly exploring the city was exceptionally simple. 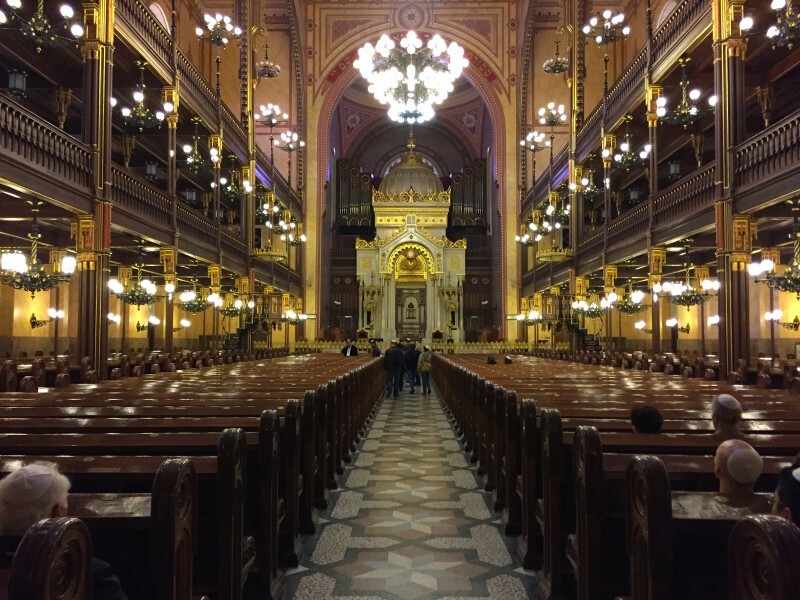 I visited the Hungarian Parliament Building and walked along the Danube Promenade to the Dohány Street Synagogue, the world’s second biggest synagogue. It was difficult to truly visualize the magnitude of the entire synagogue because of the narrow surrounding roads, but the inside was absolutely beautiful. The Temple Emanu-El in New York City (the world’s biggest synagogue) was actually modeled after the Dohány Street Synagogue, understandably so. 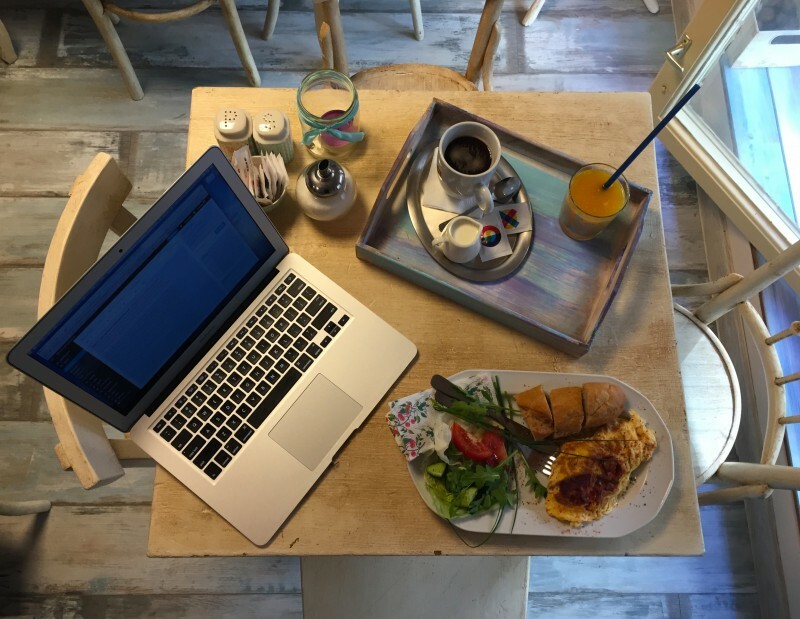 I spent my mornings working at Anyám Szerint with fresh squeezed orange juice, great coffee, and an outstanding English Breakfast assortment sprinkled with Hungarian paprika, all for about eight dollars. Come to think of it – in just a few days, I ate more paprika than I probably have in my whole life. 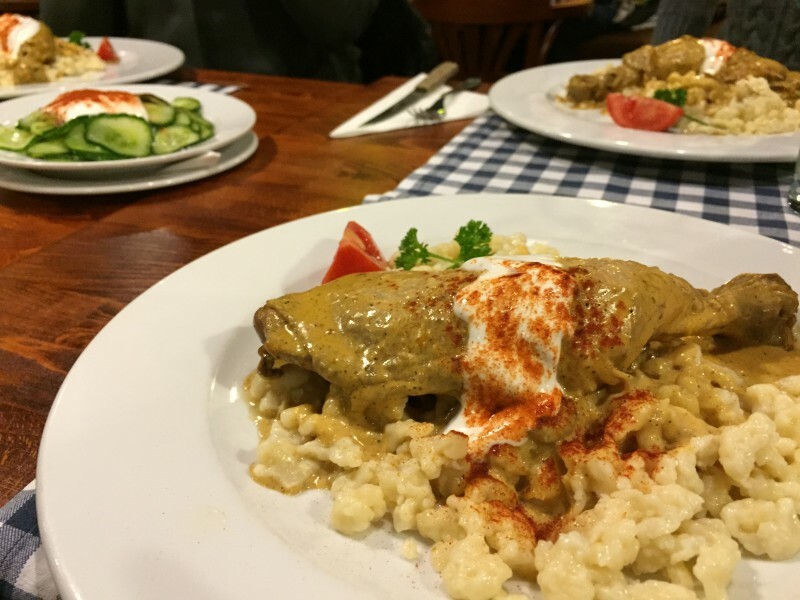 The cliché, “You’ll never be Hungry in Hungary” is completely true. I definitely took advantage of how ridiculously cheap the food and drinks are in Budapest. After dinner on our last night, my roommates and I were craving something sweet. I vaguely remembered my tour guide talking about “Chimney Cake” so I looked online for where to find one. It was nearly 9pm, just ten-minutes before Molnár’s Kürtőskalács was closing, so we spontaneously sprinted a mile across town to get a cake. We arrived two-minutes after closing, but managed to get the very last cake* and together we inhaled it within a minute. Unfortunately, it wasn’t as good as Prague’s Trdlo, but it was well worth the run. All in all, I really enjoyed every quirky aspect of Budapest and I definitely recommend visiting if given the opportunity! * I still don’t know why they call it a cake, it’s really like a European Churro.